Snips and Snails and Puppy Dog Tails: All the Better . . . I am sure he's thinking, "Love my MeeMaw!" Can't you just see it in his eyes? So sweet! and didn't you just post that you'd gotten rid of what could have been his ride? A simple sidecar alteration is all that was needed, it's a travesty I tell you! You've been robbed little man, robbed! Doesn't get cuter than this!! To me he looks like your little pirate boy! Such a gorgeous and sweet face!! Awwwww!!!! 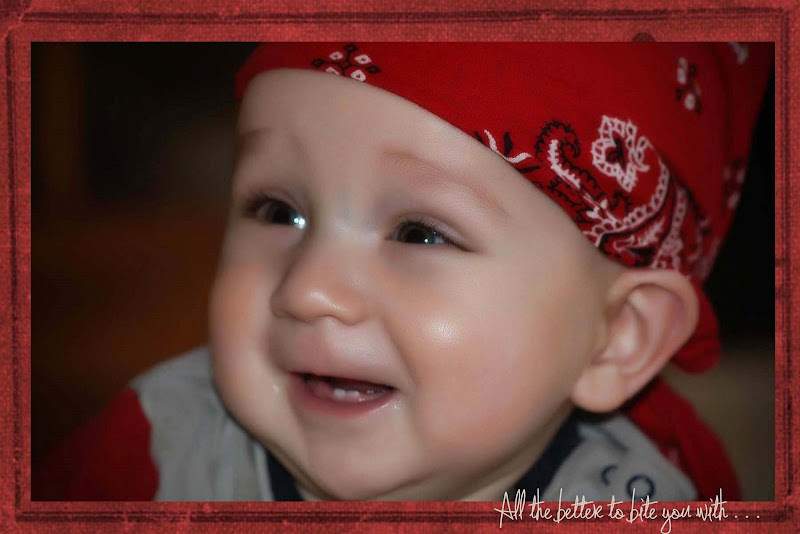 !He looks adorable in his bandanna...sporting those lovely pearly whites. Our little one is 15 months old and is just now getting two uppers and one lower. Now you just need that awesome bike back to complete the picture!!!!!!!! "hey Meemaw - where's the bike?"